The Allen Tension Gauge is an instrument for measuring the tension drop in bandsaws and circular saws. It can also be used for leveling. Saw research is showing that consistent tensioning around the blade is more important to saw performance than how much tension is used. This gauge provides an exact measure of tension drop that is far more accurate and easy to use than the traditional circle gauges. Every filer reads a circle gauge differently. Some work to a black gauge, most work to a little bit of light. This can lead to large differences in tension even if all the filers have accurate gauges. 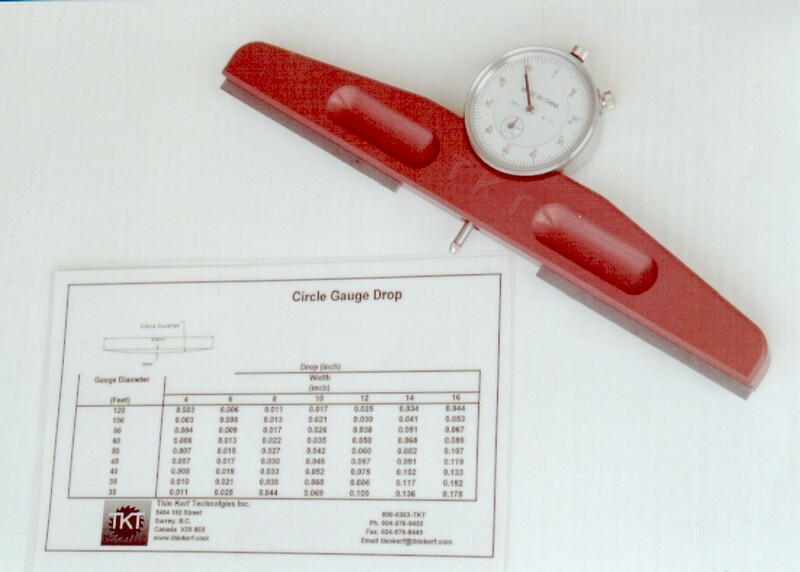 The Allen Tension Gauge comes with a chart relating circle gauge diameter to the drop measured by the dial. 3 inch gap in the blade allows the gauge to be used for leveling. This instrument was originally invented by Ed Allen, developer of the Letson & Burpee air strain bandmill.